I love the reaction I get when I tell people that I don't eat fruit. The response, along with a look of horror and/or disbelief: "What???? How could a person not eat fruit? Fruits and vegetables are healthy. They're the healthiest of the healthy? Right?" "Grains. Fruit. Bread. Cake. Beans. Snack foods. Rice. Potatoes. Pasta. Breakfast cereal. Bagels. Muffins. They look different, but dietarily speaking, they're essentially the same." Dr. Bernstein's Diabetes Solution, p. 137. Little, Brown and Company, 2011.
" Fruit contain high levels of fast-acting carbohydrates. Maltose and Fructose- Malt sugar and fruit sugar for example, are slower acting than sucrose--- table or cane sugar--- but they will cause the same increase in blood sugar levels. Dr Bernstein's Diabetes Solution, p. 141. Little, Brown and Company, 2011. PLUS... fruits have been selectively bred (hybridized) for increasing sweetness over the last 200 years, dramatically increasing the fructose content from the fruit's original state. Fruit was NOT originally as sweet (or as large) as it is today. To be honest, I love fruit. I mean really love, love, love it. The thought of giving up fruit 18 months ago was nearly heartbreaking... but I did it and I'm much healthier because of it. Before starting a low carb way of eating in January 2015, I was addicted to fruit and I was always eating 5+ servings of fruit per day. A banana or apple was my go-to snack. I had fruit for breakfast, for lunch, for snacks and before bedtime. I thought fruit was completely healthy and I ate it in excess. Some people choose to eat a few berries (blueberries or blackberries are some of the lowest in carbs) but beware, this is a slippery slope. If you are like me, with major sugar cravings, a few berries could lead to eating a pint of berries, or some other high carb food that will de-rail your good BG control. I've learned the hard way that I need to devote 100% effort to this way of eating. No fruit. Not a bite, or I will fall off the wagon. Click on the images above for a better view. While I don't believe in Recommended Daily Percentage of carbs given by the FDA, these charts are used because they're the most widely accepted. You will see that the fruit chart has significantly higher carb and sugar content than the vegetable chart. 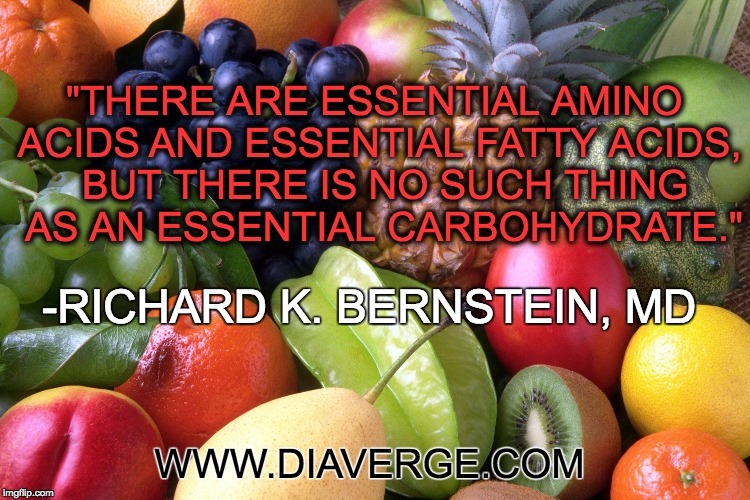 For example, an apple, banana or pear all have the equivalent carbohydrate in one piece of fruit (between 26-34 grams, depending on size and type) as Dr. Bernstein's plan calls for in an entire day. That amount of carbs really adds up quickly. The vegetable chart (with the exception of potatoes and corn, which is really a grain) is much lower in this category. Pumpkin, sweet potato and various greens (kale, spinach, collard greens, mustard greens, dandelion greens) are high in vitamin A. Information regarding many other vitamins and minerals such as B1, 2, 3, 5, 6 and 12, folic acid, magnesium, biotin, D3 and K are not listed on the charts above but can be compared in depth by using the FDA Nutrient Search or SELF Nutrition Data. Dr Bernstein lists winter quash on the No-No foods list, but then states he occasionally eats 1/4 cup of pumpkin for 6 grams of carbs. Following this example, I can eat very small amounts of pumpkin, spaghetti squash and other winter squashes, but stick with this tiny 1/4 cup serving size and pair it with other green veggies for more bulk. Fiber is inherent in vegetables, nuts and seeds. If you need additional fiber, try adding psyllium husk (either whole or ground) to recipes. I use this brand. Psyllium husk is a 100% fiber supplement that has 0 net carbs. Use only a small amount to start and add more to your diet as needed. For additional help achieving a healthy gut, drink plenty of water, consider a probiotic supplement, and add healthy fats to your diet such as avocado, coconut oil and Extra Virgin Olive Oil. So, in a nutshell, most fruit is very high carb and the nutrients can be obtained with eating vegetables. There are incredible benefits (to which no one can argue) to eating kale, spinach, broccoli and avocado- technically a fruit, but an important part of low carb eating-- to name a few. Eat your veggies - your body can do without the fruit- and your blood glucose levels will be much steadier without the high levels of carbs. For more information, visit Dr. Bernstein's site, buy the book, and/or contact us with questions. As always, our goal at DiaVerge is to bring you information regarding low carb eating, diabetes research and management techniques. We discuss how these techniques can be used in everyday life---including our everyday lives. We are not doctors and this should not be taken as medical advice. Whenever starting a new way of eating that involves carbohydrate reduction, discuss appropriate reductions in medications with your doctor to avoid potentially serious hypoglycemia.